The afternoon before I left for Los Angeles, I walked into my boss’ offices for our weekly meeting. He was turned away from the door, staring at his laptop, captivated by a music video. “Do you know these guys?” he asked. Quick cuts and violent camera movement showed a masked group of lean, totooed, scrappy men angrily tearing what appeared to be a filthy, poorly-lit hotel room to bit with all of the cliche’s intendant tropes: shattered mirrors, shredded sheets and exploded televisions. From Marilyn Monroe to Natalie Wood to Sharon Tate, Hollywood has always had a dark side. For every Young Hollywood starlet posed in front of a step-and-repeat, there are a thousand also rans. The price of those few, fleeting moments before the flashbulb’s glare is steep. Few of the chose, it seems, make it out alive. Most mornings last week, just as the California sun, broke over the San Bernardino Mountains, I set out to bag a few miles, clear my head, and gather myself for the day ahead. 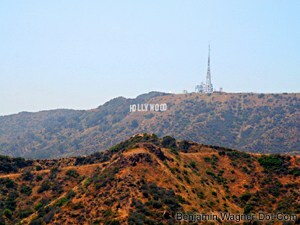 Typically, I ran west through Hollywood to Beverly Hills then back east along Sunset. The dark side of Hollywood especially evident at daybreak. Three times, I passed a woman sitting on the corner of San Vicente and Santa Monica Avenues. She sat on the steps of an abandoned storefront, her hair a tangled, matted mess, clutching a sign that read, “Help Me Please” while staring into the morning sky. A few blocks later, in front of the famed Troubadour, a man no more than forty paced the empty sidewalk preaching to no one at all, shaking his fist and swearing as I jogged by. I spent the few hours of downtime I had between our show’s premiere and the Oscar Red Carpet with my friend of over twenty years (we’ll call him Jimmy Degoodness) driving from Hollywood to Malibu to Santa Monica and back. Saturday night found us back at my hotel bar sharing a few late-night beers. Our bartender, extra-generous, perhaps, on account of either her boredom or my woeful tale of a thirteen dollar room service beer, was plying us with drink and story alike. Nicole, it seems, had moved to Hollywood from Portland, Oregon, less than five years prior. Her eyes, though, betrayed her. Somewhere behind her steely confidence was a different story. She was of a certain age, and a certain degree of beauty, that suggested strongly — perhaps — that she’d been a terrific success in high school. Maybe she played the lead every time. And so she got her teeth capped, packed her bags, and drove south to the PCH, then west into Hollywood. Fives years later, she was tending bar at a boutique hotel just below Sunset. “I still haven’t been to San Simeon,” she said. Nicole stories are legion: from Joe Gillis to Rebecca Schaeffer, it rarely ends well. Invariably, though, it ends. The Hollywood Forever Cemetery was founded in 1899 on the back half of the Paramount Pictures lot there on Santa Monica between Van Ness and Vine. It’s gone on to become the choice for most of the founders of Hollywood’s great studios, as well as writers, directors, and, performers, Cecil B. DeMille, Jayne Mansfield, Rudolph Valentino, Douglas Fairbanks, and hundreds more of Hollywood’s greatest studio heads, stars, writers, and directors. It’s “funeral chapel is equipped for live worldwide webcasts of services.” And it’s trade-marked Lifestories Kiosks (“Because memories are extremely fragile; in time, they fade.”) aggregate photos, film and video tape of “major life events” in a space-aged, stainless-steel, permenant monument. Which, it occurred to me Sunday night as Brad and Angelina floated past me (‘Huh,’ I thought, ‘That’s Brad Pitt and Angelina Jolie, like, for real.”), is what it’s all about, really. Memories are fragile. In time, they fade. If we burn brightly, though, and projector ourselves through celluloid, pixels or electrons, maybe we will be remembered. Maybe we will last forever. But it’s there; it’s the other side of that coin, and you can feel it as the plane dips and descends someplace just past Las Vegas. Your heart starts pumping in anticipation; you see the beach, or the brightest stars at night. They are all streetlights in an endless web of electric spider casings built to hold one million dreams a second in one million tiny apartments. That’s why they’re there, stretching, starving and striving for some sort of plastic immortality that, when the power goes out, flickers, fades, and disappears.